the Billie A. Hall Public Safety Center is being constructed in the Sheffield Crossing development at 602 west morrow road. The 40,000 sq. ft. facility will relocate existing northside police and fire stations as well as municipal courts, 911 communications, emergency operations, and the jail. The facility is named for distinguished service cross recipient billie a. hall, a sand springs native. The City of Sand Springs is developing plans for a Visitor’s Center and Observation Platform at the Keystone Ancient Forest, funded by a 2017 GO Bond measure. A new ninth-grade center is planned on the campus of Charles Page High School following the passage of a 2019 school bond issue. The 2017 GO Bond Package will provide for beautification efforts across the city. the trail around clyde boyd middle school and pratt elementary will receive a remodel thanks to the passage of a 2017 bond issue. 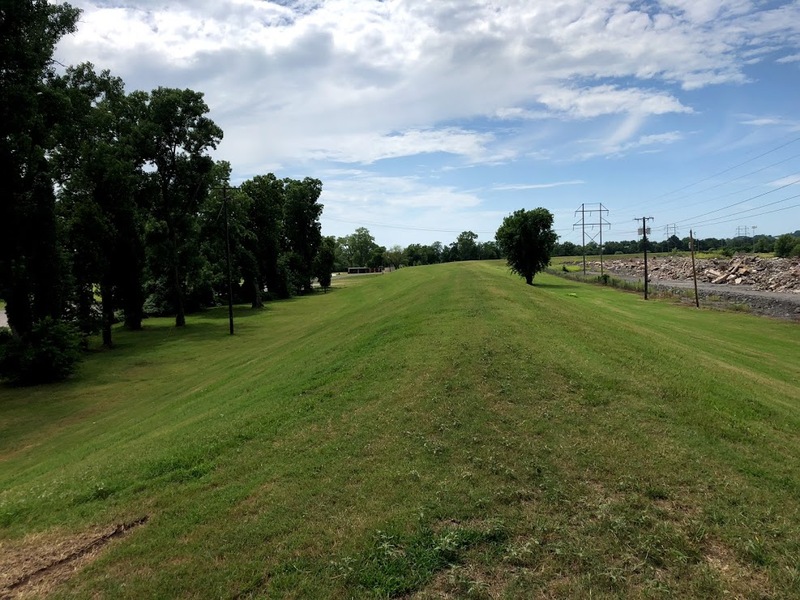 Part of the 2017 GO Bond package will pay for a new roadway over the levee in Case Community Park. the old steel mill is no more and the Sheffield Crossing Development is rising from the ashes. Springloaded Brewery is still in the works at 225 South Main Street. the microbrewery is still looking for investors. the 12-lot Rivercrest Housing Development is being developed at the intersection of 32nd street and south 113th west avenue. the teal ridge housing development contains 115 lots on 41st street near berryhill. Sand Springs is the perfect place for your next development. Whether you are looking to build shopping centers and housing additions, or to expand your business operations, this is the town for you! The Tulsa bedroom community offers great quality of life with extensive parks and recreation opportunities including camping, rafting, hiking, fishing, boating, rock climbing, and more. Biking and walking trails weave strategically throughout the city to provide both recreation and alternative transportation for the eco-friendly. With some of the best public schools in Oklahoma and 6A athletic programs, Sand Springs is the ideal place to raise a family. The success of recent housing developments such as Teal Ridge, Walnut Ridge, Lakeside, Timberling Hollow, and Stone Villa shows that "if you build it, they will come." Highways 51, 412, and 97 bring large amounts of traffic through Sand Springs, making it a great place for commercial development, especially hotels, motels, and eateries. Pogue Airport is a highly-acclaimed regional business airport and provides a convenient alternative to Tulsa International for small commercial traffic. The terminal includes conference rooms, office space, and weather monitoring and flight planning equipment. The Sand Springs Railway Company is a Class Three freight rail service operating 32 miles of track between Sand Springs and Tulsa, and connecting with Union Pacific and BNSF. Their services include rail-to-truck and truck-to-rail transloading and inventory management. Sand Springs is a thriving suburb with a median household income of $56,401. 88.9% of Sandites have graduated high school and 21.1% hold bachelor's degrees or higher. The Sand Springs Trade Area includes the towns of Hominy, Pawnee, Cleveland, Yale, Oilton, Mannford, and many smaller unincorporated communities as well as the Skiatook and Keystone Lakes. Dr. Cannabis LLC opens in Cox Center. - Read Story. Therapeutic Herbal Care opens at 1126 E. Charles Page Blvd. - Read Story. Nature’s Apothecary opens in Cox Center. - Read Story. Tulsa Bone & Joint opens clinic in Springs Village. - Read Story. Sandlot Sno-Balls opens second location at Prattville Center. - Read Story. ALDI grocery store opens in River West development. - Read Story. Sand Springs Leader closes local office. - Read Story. Sand Springs Flowers changes ownership and location. - Read Story. ZegART Studios opens in Atwoods Plaza. - Read Story. AcupunctureOK relocates from 302 N McKinley to 25 E Broadway. American Shaman opens at Atwoods Plaza. Prattville QuikTrip reopens after total demolition and reconstruction. The House of Hair and Boutique rebrands as OkieGirls Salon and Boutique. "The Waiting Station" mural by Josh Butts is complete in downtown. Atwoods undergoes massive expansion, takes over neighboring storefronts. Colton's Steak House and Grill opens in River West. Construction begins on Rivercrest housing development. Coble's Flowers relocates from The Shops at Adams Road to 206 North Main Street. Warren Clinic Primary and Urgent Care opens in River West. - Read Story. Myers Marketing and We Are Sand Springs relocate to 118 North Main Street. Automatic Spotless Car Wash at 3300 South Highway 97 is demolished. Chere's Hallmark Gift Shop closes in Springs Village. Ed and Tracy's closes on Charles Page Boulevard. QuikTrip reopens at 2 West 41st Street after being demolished and rebuilt. New Fire Station No. 2 is built and old building is demolished. Kelly Smith opens Farmers Insurance location in Springs Village. Brownie's Hamburgers opens in Shops at Adams Road. Ray Brown Park receives $37,000 renovation. - Read Story. Payless ShoeSource closes Sand Springs location. - Read Story. OSU Medicine opens new clinic in Adams Road Shopping Center. Chinowth and Cohen Realtors construct new building in Prattville. Warehouse Market rebrands as Cox Cash Saver's. Future Vision Ministries closes downtown storefront. Celeste McCracken opens The Ground Floor Salon at 401 East Broadway Court. River City Park is renamed Case Community Park after $6.2 million renovation. - Read Story. Edward Jones Investments Agent Casey Loper opens new Prattville location. - Read Story. Stage department store relocates from Atwoods Plaza to 651 East Charles Page Blvd. - Read Story. Green Barn resale shop is destroyed by fire. - Read Story. It's Just a Girl Thing Boutique opens in Prattville. Firestone rebrands as Guaranty Auto Service. The House of Hair and Boutique opens at 407 East Broadway. El Patron Cocina Mexicana opens in Shops at Adam's Road. Church That Matters buys Do-Overs Furniture and The Prattville Market. Bottoms & Beyond Boutique closes business. Construction begins on Teal Ridge housing development. Silver Linings Boutique closed storefront in downtown, moved to booth in The Vintage Stables on Main. Beau Wilson Insurance opens in downtown Sand Springs. The Book Box closes in downtown Sand Springs. Terry's Classic Coneys partners with Harper's Hut Shaved Ice to serve Harper's in Prattville. Kim and Jeremy Herrington open Harper's Hut River City Concessions. Sandlot Sno-Balls closes River City Concessions location. Sandite Pride News, LLC officially incorporates in Sand Springs. Broadway Barber Shop opens in downtown Sand Springs. Urban Tails pet shop closes in downtown Sand Springs. Stacys' Resale Shop opens in downtown Sand Springs. Mike and Lisa Miller open YellowHouse Market & Boutique in Livi Lee's Shopping Center. Troy and Stephanie Cleveland open The Vintage Stables on Main at 115 North Main Street. Brad Crain opens Sandlot Sno-Balls in former Livi Lee's Summer Snow building. JwY's Snowcones rebrands as Livi Lee's Summer Snow under same owners. Livi Lee's Daylight Donuts opens Prattville location. The Book Box relocates from Prattville to downtown Sand Springs. Sandlot Sno-Balls opens River City Concessions. Holiday Inn Express opens in RiverWest Development. Mile High Designs opens at 13722 West Highway 51. William Nozak opens Harper's Hut Shaved Ice & Java on Charles Page Boulevard. Spring Dental opens at 530 Plaza Court. Sand Springs Autosource opens at 1114 East Charles Page Boulevard. K-Mart closes its 1200 E. Charles Page Blvd. location. April Sellers opens Silver Linings Boutique in downtown. Johnathan Wygle purchases Shipley's Daylight Donuts on Kampus Korner, rebrands as Livi Lee's Daylight Donuts. Quilt Nuts opens at 216 North Main Street. Advanced Weight Loss Clinic of Sand Springs opens at 401 East Broadway Court. Joni's on the Triangle Hair Salon opens at 211 North Main Street. The Hartford Sand Springs Insurance opens at 203 North Main Street. Laurie Joslin closes Chastain's Casual Cafe, opens DejaVu Decor at 122 North Main Street. Elizabeth Rose opens Boomarang Diner at 120 North Main Street. Dustin Wyzard Insurance opens at 203 North Main Street. GX2 Records is founded by I.J. Ganem and Morgan Ganem in Tulsa. American Legion Post 17 was renamed after Billie A. Hall. Keystone Ancient Forest park is founded. Snapdragon Photography begins doing business in Sand Springs. Johnathan Wygle opens JwY's Snow Cones in Warehouse Market parking lot. Battman Collision Repair opens at 702 East Pecan Street. The Lunch Box expands into neighboring storefront. Rebrands as Chastains Casual Cafe and Catering Company. Integrity Pest Management opens at 4010 South 113th West Avenue. Laurie and Don Rhodes open The Back Porch Cafe at 122 North Main Street. Dianne Platt and Libby Robinson open Tasteful Treasures at 12 West 2nd Street. Kandice Rinowski and Grant Simmons open Painted Picket at 10 West 2nd Street. Paula and Lonnie Stevens open Point of View decor at 28 East Broadway. Jynell and Donald Cowett open Sand Springs Harvest Health Food & Herbs. Cecil & Sons Discount Tires opens Prattville location at 4002 South Highway 97. Dr. Mehrdad Emami opens Galleria of Smiles at 104 West 41st Street. West Side Alliance Soccer Club is founded. Oklahoma Martial Arts America opens. St. Andrew Lutheran Church opens at 3210 South 113th West Avenue. Sand Springs Flowers relocates to 206 North Main Street. Spoon Drug opens at 540 Plaza Court. Doug's Sand Springs Rebuilders opens at 116 North Main Street. St. Patrick's Parochial School closes its doors after 50 years. Dean's Coney Island opens for business at 634 East Charles Page Boulevard. Cecil & Son's Discount Tires opens at 204 East Morrow Road. Keystone Dam construction is completed, Keystone Lake is formed. Construction begins on Keystone Expressway, destroying majority of sandy springs. Firestone opens at 215 East Broadway Street. Construction begins on Keystone Dam. Sand Springs streetcar system closes. Sand Springs Sand & Gravel Company opens. American Legion Post 17 receives permanent state charter. New concrete Arkansas River bridge is finished. Page Memorial Library is constructed by request of Lucile Page. Statue of Charles Page is unveiled in Sand Springs Triangle. St. Patrick's Parochial School opens in St. Patrick's Cathedral. Construction of Shell Lake Dam and founding of Shell Lake. First Christian Church of Sand Springs opens at 501 North Main Street. American Legion Post 17 is founded with a temporary charter. St. Patrick's Catholic Church is founded. First Christian Church of Sand Springs is organized. Sand Springs Home dormitory construction is finished. First bridge across Arkansas River is built. First Presbyterian Church constructs new facility at Fourth and Main. Construction begins on four-story brick dormitory at Sand Springs Home. City of Sand Springs is incorporated. Sand Springs Home is incorporated. Construction begins on Sand Springs Power and Water Company. The Community Church is founded. It is later renamed First Presbyterian Church of Sand Springs. Charles Page acquires land that will become Sand Springs. Charles Page opens Sand Springs Flowers. State of Oklahoma is founded. Tullahassee Indian Cemetery is founded.